Sonormed is a Hamburg-based medical technology company with a strong focus on digital audiology and was founded in Hamburg in 2012. Building a unique infrastructure that integrates regulatory requirements (e.g. medical device regulation), specific needs of ENT physicians and the requirements for reimbursement is the core mission of Sonormed. The company cooperates with well-known industrial companies, insurance companies and research institutes. Against this backdrop Sonormed leverages their sound technological know-how in digital audiology for diagnostics, therapeutic use and workflow management to build a portfolio of related products. Our interdisciplinary team of sound engineers, computer scientists and neurobiologists develops state-of-the art solutions to improve hearing impairments. Sonormed’s most widely recognised solution is Tinnitracks, a fully digital therapeutic app for tinnitus patients. Tinnitracks is a certified medical solution providing access to the scientifically validated Tailor-Made Notched Training (TMNMT), a neuro-acoustic treatment approach that targets hyperactive nerve cells underlying the perception of tinnitus. 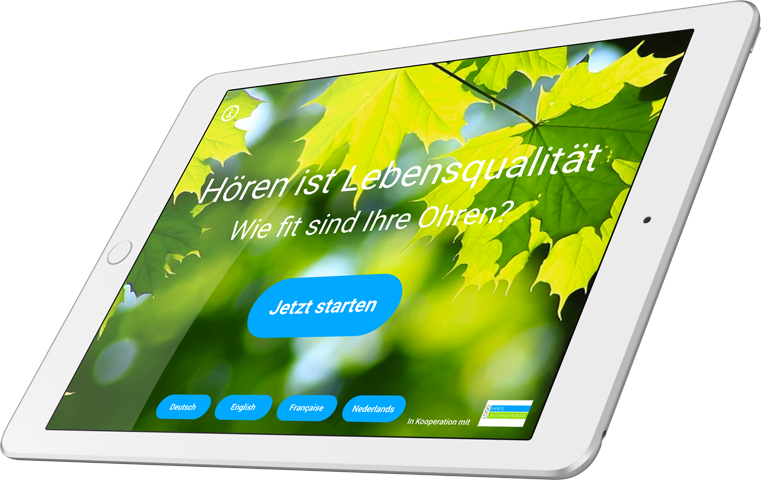 In Germany, Tinnitracks has become the first therapeutic app to be reimbursed by statutory and private health insurances. Heading towards a complete integration into the existing healthcare system, Sonormed was able to receive numerous prestigious awards for the development of Tinnitracks, e.g.,the renowned US technology award SXSW in “Digital Health & Life Sciences Technologies”. Sonormed GmbH was founded by Adrian Nötzel, Jörg Land and Matthias Lanz. The management consists of Jörg Land and Matthias Lanz. Jörg Land, responsible for marketing and business development, was responsible for marketing and product management in various IT companies. Matthias Lanz, who heads the IT department, can also draw on previous experience in founding a company and in developing international structures. Co-founder Adrian Nötzel, responsible for the product development, complements the team’s competence in the field of audio technology. The Sonormed team also includes developers, psychologists and medical professionals. In acknowledgement of the development of Tinnitracks, Sonormed has been named “Excellent Site” for a digital world. The initiative “Germany – land of ideas” has opted for Sonormed, because Tinnitracks makes a positive contribution to the shaping of a connected world and has thus immediate relation to the topic of the year. Additional arguments in favour of the award decision included future orientation, strength of implementation ans innovation as well as a role model character. In 2015, Tinnitracks was honored with the Great Prize of the SXSW Accelerator competition in the category “Digital Health & Life Sciences Technologies”. For the first time, a German team of founders, which prevailed against strong international competition in Austin, Texas, has been awarded this prize in said category by a jury of recognized experts. Tinnitracks has been selected as the best EU-wide project in the category Health & Well Being at the European Institute of Innovation and Technology (EIT) in Eindhoven. In addition to the prize money, Tinnitracks is allowed to use office space at one of EIT ICT Labs’ co-location centers and benefits from mentoring as well as the invaluable opportunity to become part of the biggest innovation network in Europe with over 120 partners (e.g. Fraunhofer, Intel or Siemens). Tinnitracks was awarded the Innovation Prize by the German Society for Computer Science on September 17, 2013. This acclaimed prize is awarded for excellence in innovations that are clearly related to the field of computer science and that have a distinctly recognizable practical application. “In choosing Tinnitracks we are honoring an invention that […] provides a direct benefit to society”, said GSCS Vice President Prof. Dr.-Ing. Peter Liggesmeyer. Tinnitracks was awarded the coveted “ICT Innovation” prize at the 2013 CeBIT by German Federal Minister of Economics and Technology Dr. Philipp Rösler. Tinnitracks was selected over numerous competitors for the “Start-up Competition – ICT Innovative” prize. The innovative approach close to market’s needs that characterises the successful solution for tinnitus patients secured the prize. Tinnitracks was chosen in the presence of 120 select researchers, companies and investors to receive the Heidelberg Innovation Forum’s 2013 award. The Tinnitracks technology, the team’s execution and the product’s distinct added value convinced the judges to select Tinnitracks as the winner. Tinnitracks was chosen as the winner of the “2012 CDTM Idea Challenge” and awarded the European innovation prize “Future Enterpreneurs’ Award” in December 2012. Tinnitracks won the jury over with its advanced approach to tinnitus therapy. The technical conceptualization of the product idea allowing the user to conveniently and intuitively use a product that is so complex in its development was particularly noted. Tinnitracks received both the Public Choice Award and the Jury’s Choice Award at Hamburg’s major industry event of the Music und Digital Industry. Tinnitracks won over both the expert jury panel and the visitors at the industry conference. This was the first time prizes were awarded during the famous “Reeperbahn Festival” in Hamburg, a music festival followed by an industry conference, on September 29, 2013. Unlike as previously thought, tinnitus does not develop in the ear, but in the brain through pathologically overactive nerve cells. This overactivity can be soothed by listening to individually filtered music so that the tinnitus volume is noticeably and sustainably reduced. Enjoying music to fight tinnitus – Tinnitracks is realizing it. 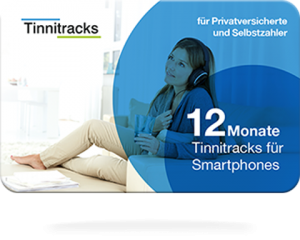 With Tinnitracks, tinnitus sufferers can simply use their favorite music for their daily tinnitus treatment. The app helps you to filter out your individual tinnitus frequency from selected pieces of music. 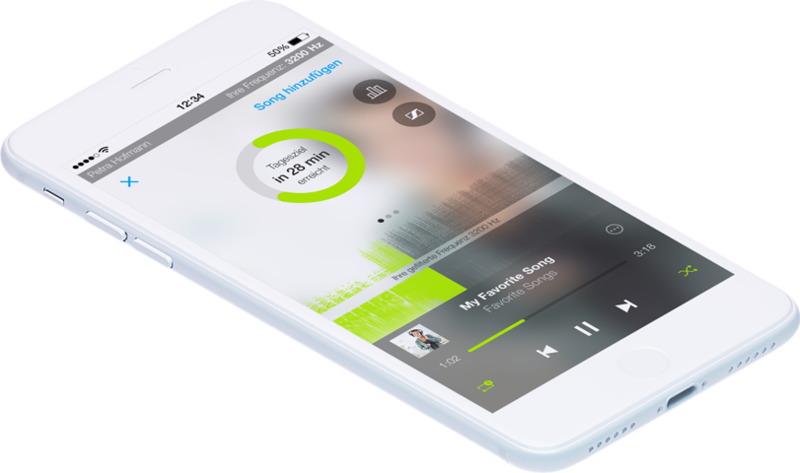 The Tinnitracks app reliably analyzes, whether a piece of music is suitable for therapy, and it supports users with additional functions to enable the best possible implementation of the therapy. 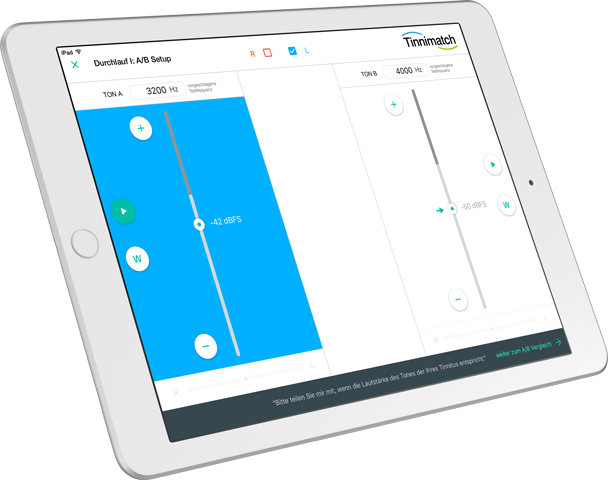 Tinnimatch facilitates the determination of patients’ tinnitus frequencies by ENT physicians and hearing healthcare professionals – and it works without a high-frequency audiometer. It is possible to effortlessly determine frequencies up to 20 kHz. All that physicians and acousticians require is the Tinnimatch App, an iPad and the specially designed Sennheiser HDA 280 headphones. Hearing loss is often a subtle process that is only discovered at an advanced stage and affects the life and efficiency of the individual. In 2017 Sonormed will be launching a new audiology solution that supports early self detection. Sennheiser, a traditional German company with international standing, is one of the leading manufacturers of microphones, headphones and wireless transmission systems. For more than 65 years Sennheiser has been the equivalent of quality products, realistic sound and tailor-made solutions. In close cooperation with Sennheiser, three headphone bundles were specifically designed for use with Tinnitracks to provide optimal conditions for therapy. We rely on Sennheiser’s headphone expertise throughout our portfolio. The products of Sonormed are adapted to the requirements of health insurance companies in order to facilitate access to products such as Tinnitracks for policy holders. The European School for Interdisciplinary Tinnitus Research (ESIT) is an education program funded by the European Union with the goal to promote inter-disciplinary tinnitus research in Europe. Within the “Horizon 2020” program, the EU supports the ESIT program with 3.8 Mio. Euro for the next four years. ESIT educates 15 PhD students across Europe with outstanding academic as well as personal skills to perform excellent tinnitus research. Twelve universities from ten European countries and 34 academic, clinical and industrial partners will be coordinated by the University Clinic Regensburg to carry out the tinnitus research. Among the goals of the ESIT research project is the development of individualized treatment methods, first genetic studies on tinnitus, and building up the largest pan-European database for systematic and inter-disciplinary tinnitus research. Sonormed GmbH develops innovative technologies in the area of digital audio. In June 2014, the European Institute of Innovation and Technology chose Sonormed as the most innovative company in the health sector across the EU. Become part of a success story - become part of Sonormed.